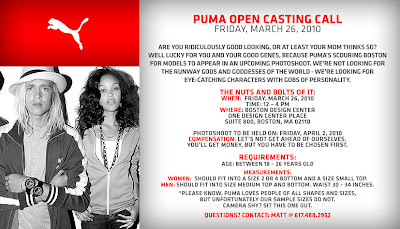 At 5 foot nothing, I will certainly not be heading over to the Puma open model casting tommorow, but all you tall beautiful people certainly should! And for the rest of us, there's plenty more to do this weekend after the jump. Shop the handbag designer's spring 2010 collection and have Minkoff herself sign your purchase. (Plus, there's free snacks and cocktails.) Be sure to RSVP to tommie_watson@s5a.com. Support local design! Check out Corte's new studio space, and stock up on pieces at 60-80% off. I went to this sale last year and walked away with an amazing green wool sheath dress (very Betty Draper) at a fantastic price. So many sample sales lately! The Cynthia Rowley boutique on Newbury is offering up to 80% off on one-of-a-kind sample pieces and resort 2010 items.